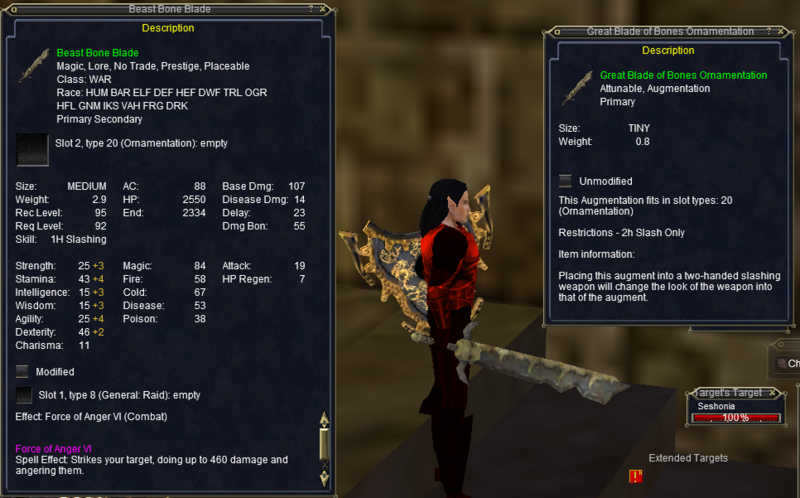 Great Blade of Bones --> Blade of Bones? Discussion in 'The Veterans' Lounge' started by Denial_Sinfae, Jun 12, 2018. When the change happened to ornaments to allow them to be converted, we didn't get it with the Great Blade of Bones. It already exists as a 1h. Can this be added to the convertible weapon ornamentation's? Yea. Not sure what you are asking for. all we did was make the old container type ornaments, that were one use, into the exact type of ornament that Great Blade of Bone is. A reusable type 20 augment ornament. So there's no need to do that to this. It was a convert 1h to 2 hand... or such. I have a Shield of flowing blood that I bought from the marketplace. It was a container type aug. Last time I looked , I still can't remove it so I can use on another shield. Am I missing something? Containers that were already used will not turn into the aug. If you already used it before the change it's stuck as the 1 time use. I'm sure lots of people used the 1 time only Sword of Truth ornament and are regretting it now lol. We got what was advertised though, so can't dwell too much on the past. Yes. Sorry. I am requesting it be type 20 without the 2h restriction- the graphic already exists in 1h form it doesn't seem like much of a stretch, if at all. Since I'm not aware of a way to get this item anymore? (Is it in open of the new "LoN" packs you can get in the marketplace? I didn't have time to dig through that stuff.) I'm leery of making an adjustment to it. Yessir. That's where I got it. Edit: And they're tradable in the bazaar before claiming.